OTTAWA — Canada granted asylum on Friday to the Saudi woman who won the world's attention on social media in her desperate attempt to flee an abusive family after escaping to Thailand. Prime Minister Justin Trudeau announced that Canada would accept 18-year-old Rahaf Mohammed Alqunun as a refugee, after she was stopped last Saturday at Bangkok airport by immigration police. Police denied her entry and seized her passport, while her brother and father travelled to Thailand to take her back to Saudi Arabia. Trudeau brushed aside suggestions that the move might complicate already strained relations with Saudi Arabia, while the organization Human Rights Watch praised Canada for acting swiftly to provide sanctuary to a vulnerable young woman. Alqunun barricaded herself in an airport hotel room and launched a Twitter campaign that drew global attention to her case. 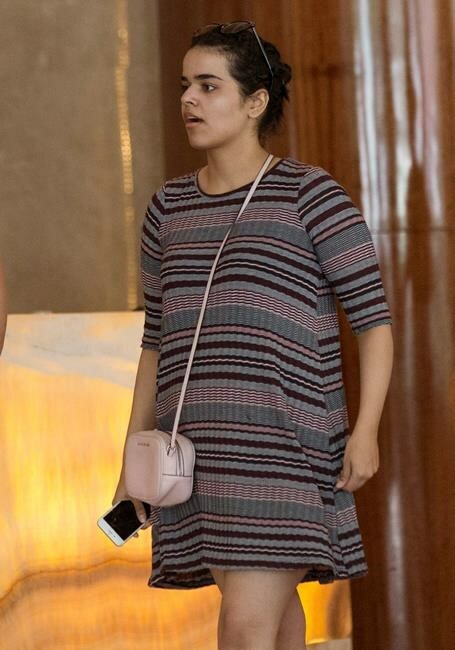 Canadian diplomats in the Thai capital were seized with her plight immediately, and though Alqunun originally said she wanted to reach Australia, it became clear in the past week that Canada represented her quickest path to freedom. Trudeau announced during a press conference in Regina that the United Nations High Commission for Refugees asked Canada to take Alqunun as a refugee, and Canada agreed. "That is something that we are pleased to do because Canada is a country that understands how important it is to stand up for human rights, to stand up for women's rights around the world," Trudeau said. Alqunun's case once again shone a spotlight on the state of women's rights in Saudi Arabia. Many Saudi women fleeing abuse by their families have been caught trying to seek asylum abroad in recent years and returned home. "I'm the girl who ran away to Thailand. I'm now in real danger because the Saudi Embassy is trying to force me to return," said an English translation of one of her first postings to Twitter. Alqunun also wrote that she was afraid and that her family would kill her if she were returned home. The Twitter hashtag #SaveRahaf ensued, and a photo of her behind a door barricaded with a mattress was seen around the world. The Trudeau government's decision is sure to further strain Canada's relations with Saudi Arabia. In August, Saudi Crown Prime Mohammed bin Salman expelled Canada's ambassador and withdrew his own envoy after Foreign Affairs Minister Chrystia Freeland used Twitter to call for the release of women's rights activists who had been arrested in Saudi Arabia. The Saudis also sold Canadian investments and recalled their students from universities in Canada. Trudeau appeared unfazed by the possibility of any ill effects on Canada's relations with the Saudi Arabia. "Canada has been unequivocal," he said. "We will always stand up for human rights and women's rights around the world. This is part of a long tradition of Canada engaging constructively and positively in the world and working with our partners, allies and with the United Nations. And when the United Nations made a request of us that we grant Ms. Alqunun asylum, we accepted." Alqunun had previously said on Twitter that she wished to seek refuge in Australia. But Australian Home Affairs Minister Peter Dutton told reporters on Wednesday and that Alqunun wouldn't get any "special treatment" and was no different from any other similar case. Dutton's comments, coupled with the arrival of Alqunun's father and brother in Bangkok, heightened the urgency to find a safe haven for her, Phil Robertson, the deputy director of Human Rights Watch's Asia division, said in an interview from Bangkok. "There was the uncertain aspect of her father and her brother — the people she feared most — still being here, still being in Bangkok and still being present. There was a great deal of worry about that. That something might happen," said Robertson. "That was actually one of the reasons why the original idea that she might be going to Australia was switched to go to Canada, because Canada was prepared to act much quicker and really make this happen." Robertson praised the swift action of Donica Pottie, Canada's ambassador to Thailand, for her early involvement in the case and helping push the Thai government to allow the UNHCR to gain access to Alqunun, which is not something that usually happens in such cases in Thailand. "They were on it from the get-go," said Robertson. "She was part of the coalition of people that were pushing very hard when we thought we were going to lose Rahaf." Pottie was not available for comment. UN High Commissioner for Refugees Filippo Grandi welcomed Canada's decision, given the hardening of attitudes in some countries towards the plight of refugees. "Ms. Alqunun's plight has captured the world's attention over the past few days, providing a glimpse into the precarious situation of millions of refugees worldwide," he said in a statement. "Refugee protection today is often under threat and cannot always be assured, but in this instance international refugee law and overriding values of humanity have prevailed."